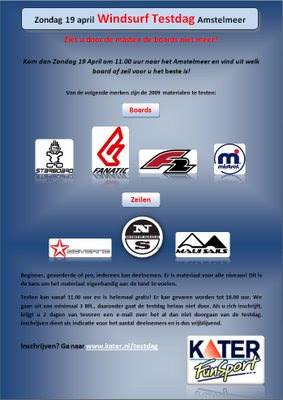 On Sunday the 19th of April there will be a testday on the Amstelmeer. A lot of 2009 gear will be there to try for all windsurfers. When the windforecast: http://windguru.cz/nl/index.php?sc=3602 is above 12kn I will be there to. Click on the picture below to register and you will be getting news about this testday in your Mailbox.